Oral microbial flora is highly complex and varied. So far, nearly 1000 microbial species have been discovered in the oral cavity of which, only around 50%–60% are cultivable.,, The presence of other bacteria is deduced only using molecular methods. Majority of oral bacteria are either harmless or play a vital role in maintaining oral homeostasis. Only a few of these bacteria are involved in the etiology of oral diseases including dental caries. Moreover, microbiota of the oral cavity is thought to be crucial to the health or disease status of the human host. Dental caries is one of the most common childhood diseases worldwide. It is known to be associated with polymicrobial colonization of the teeth. Both acidogenic and aciduric bacteria, mainly mutans group of Streptococci and Lactobacilli are known to be primary etiological agents of dental caries. Risk factors for caries include the presence of high number of cariogenic bacteria, inadequate salivary flow, insufficient fluoride exposure, poor oral hygiene, inappropriate methods of infant feeding, and poverty. Several studies have shown that dental caries is caused by potentially pathogenic microbial communities rather than a single pathogen. The cariogenicity of S. mutans and Lactobacilli in tooth-associated biofilms has long been established, based on culture studies. However, this approach has provided a limited scope to investigate the role of other species present in the biofilm communities. Recent studies involving molecular methods have highlighted the association of many yet to be cultivated bacteria with our inability to culture majority of the species residing in the oral cavity, the exact role of many of these pathogens in oral health and disease is poorly understood. With the advent of molecular techniques, bacterial diversity and community structure in different oral niches have been investigated using molecular fingerprinting methods, most commonly denaturing gradient gel electrophoresis (DGGE) and sequence analysis of microbial 16S rRNA genes. These bacteria are highly diverse at different sites and are also individual subject specific. However, the overall extent of bacterial diversity in different oral diseases including dental caries has not yet been extensively studied. Therefore, further study of bacterial diversity in the oral cavity, especially in saliva and plaque using molecular methods may provide insights for better understanding the disease process of dental caries. Keeping this in mind, the present study is aimed at studying the microbial diversity in caries-affected and caries-free (CF) children from both the plaque and saliva. The purpose of the present study was to investigate the difference in bacterial diversity in saliva and plaque samples from CF and caries-active (CA) children using polymerase chain reaction (PCR)-DGGE. This study is a part of the funded project titled “Microbiota of early childhood caries before and after therapy: A clinical, microbiological and molecular study” awarded by the Rajiv Gandhi University of Health Sciences, Bengaluru, Karnataka. Fifty-six children who attended the Outpatient department of Paediatric Dentistry Department of our institution were enrolled for the study. Their ages ranged from 3 to 6 years. Among them, 30 were males and 26 were females. Written informed consent was obtained from the parents or guardians of all participants before enrolment with the approval of institutional ethics committee. The definition and diagnosis of dental caries was based on the WHO criteria. A carious lesion was recorded as present when a lesion had an unmistakable cavity, undermined enamel, decayed softened floor or wall or felt soft or leathery on probing. Sampling was performed at least 2 h after breakfast. Participants were asked to expectorate into a sterile broadmouth container. About 2 ml of unstimulated whole saliva was obtained from each child. Supragingival plaque samples were collected by scraping the tooth surfaces with sterile curette and transferred to Tris-EDTA (TE) buffer and immediately sent to the laboratory for processing. Upon receipt in the laboratory, DNA was extracted from each sample using modified proteinase k method. Briefly, the samples were pelleted by centrifugation at 10,000 rpm for 5 min and the pellet was washed twice in TE buffer. The pellets were resuspended in lysis buffer containing Triton X-100 and Nonidet P-40. Freshly prepared proteinase k was added to each vial at a concentration of 100 ug/ml and the samples were incubated at 60°C for 2 h. The proteinase k was then inactivated by boiling the samples for 10 min. DNA was extracted by mixing the samples with 3.5 M sodium acetate and precipitated with alcohol. After centrifugation at 15,000 rpm for 15 min at 4°C, the deposit was air-dried and stored at −20°C in TE buffer till used. The V3 region of 16s rRNA gene was amplified using universal bacterial primers 968F and 1401R (reverse primer with a GC clamp). Each PCR mixture (50 μl) contained 10 picomoles/μl of each primer. Taq DNA Polymerase 2× Master Mix Red (Odense M., Denmark) was used which contains Tris-HCl pH 8.5, (NH4)2S04, 3 mM MgCl2, 0.2% Tween 20, 0.4 mM of each dNTP, and 0.2 units/μl of AmpliTaq red polymerase. About 100 ng of extracted DNA was added to the mixture. PCR amplification was performed in an automated thermocycler with the following program: 95°C for 5 min, followed by 30 cycles of 95°C for 30 s, 50°C for 30 s, and 72°C for 1 min 30 s. The PCR products were evaluated by electrophoresis in 2% agarose gel at 100 volts for 2 h. Gels were visualized in UV transilluminator. DGGE was performed on a custom-made apparatus (Bio Bee Tech, Bengaluru, India). Briefly, PCR amplified samples were loaded on 6% polyacrylamide gel containing 30% to 70% of urea and formamide. The samples were electrophoresed at 100 V for 8 h with a stable temperature of 60°C. The gels were stained with SYBR™ Gold Nucleic Acid Gel Stain (Thermo Fisher Scientific, Bengaluru, India) for 30 min and visualized under gel doc system [Figure 1]. The difference in microbial diversity was evaluated by comparing the DGGE profile among defined groups by two methods. The similarity score and cluster analysis were performed on all samples. Similarity coefficient was calculated by generating a similarity matrix between DGGE profiles of different groups. 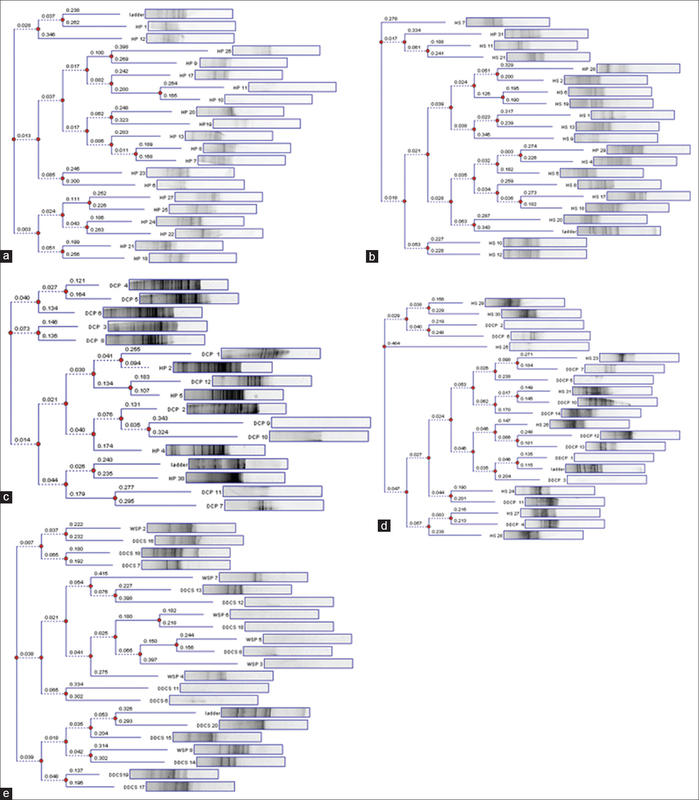 A dendrogram was created for this purpose using Phoretix 1D pro-gel software (Total lab, UK). In which “j” is the number of common DGGE bands between two lanes, “a” is the number of bands in lane a and “b” is the number of bands in lane b. A Cs value of 100% corresponds to two identical DGGE profiles. In the present study, saliva and plaque from 28 healthy individuals (HS), 8 with white spots and 20 children with deep dentinal caries were collected and subjected to PCR-DGGE for bacterial diversity. Analysis of the dendrogram patterns generated by Phoretix software revealed a number of clusters and subclusters in each group. Plaque samples from HP group showed three clusters and their pattern was distinct and did not share similarity with samples from any other group [Figure 2]a. In saliva from HS, two different clusters were seen, in which three samples from healthy plaque (HP) were included because of the similarity in band pattern [Figure 2]b. On the other hand, samples from deep dentinal caries plaque (DDCP) group showed two distinct patterns: one profile had two clusters and a few HS samples were included because of the similarity, other profile had three clusters and shared similarity with several HP samples [Figure 2]c and [Figure 2]d. There was complete overlap of white spot lesions (WSP) samples with those of deep dentinal caries saliva (DDCS); together they formed three clusters and several sub-clusters [Figure 2]e.
We also calculated similarity coefficient by comparing the band pattern (number, intensity and molecular weight) among samples from different groups (HP vs. HS, DDCP vs. DDCS, DDCP vs. HP, DDCS vs. HS, WSP vs. HP) by using the formula mentioned earlier. Analysis showed that between saliva and plaque of the same subject in both CF and CA groups, the diversity was very high with a CS of 0%–45% in CA and 0%–42% in CF subjects. When analysis of the samples between different subjects from the two groups was done, the results followed a similar pattern showing a very high diversity (DDCP vs. HP–CS of 0% to 49%, DDCS vs. HS–CS of 0% to 46%, and WSP vs. HP–CS of 0% to 60%) [Table 1]. We also calculated the number of bands and their intensity in both plaque and saliva from different groups. It could be seen that the number of bands in HS, HP and WSP were much higher than in DDCP and DDCS groups [Table 2]. The intensity of the bands was also more in samples from healthy children. DDGE profiling of the samples using number of bands showed less diversity in both saliva and plaque of deep dentin caries than those of healthy children and samples from WSP. In addition, majority of bands were of low- or very low-intensity probably indicating their low numbers. This finding suggests that the number of bacteria that can be detected at caries site is limited, because certain groups of microbes dominate plaque biofilm as caries progresses. Similar observation has been made by several other investigators.,,,, The reason for this could be that caries site contains higher proportion of acidogenic and aciduric bacteria than CF plaques. Another interesting observation was the presence of higher diversity in plaques from WSP. This indicates that there are a number of bacterial species other than mutans group and Lactobacilli are associated with initial stages of caries. The results of our study also demonstrate that the DGGE profiles from healthy and diseased sites formed significant and specific clusters. The delineation of two clusters was reflected by the number of bands detected, the intensity, and migration distribution of amplified products. While HP and saliva formed exclusive profiles, there was some shared pattern between healthy and deep dentinal caries profile. We were surprised to find that there was complete sharing between saliva from deep dentine caries and plaque from WSP and together, they formed a different pattern. We are unable to explain the reason for this at this stage and would like to wait till more number of samples from these groups are studied. There are not many studies done on the saliva samples from CF and caries-affected children., Since our results clearly shows that, both Healthy plaque and saliva have a distinct profile of their own, it would be worthwhile to investigate further how this can be exploited to differentiate a status of oral health from disease. The microbial diversity in majority of the samples in all the groups was around 60% to 80% with few exceptions where 100% diversity could be seen. This indicated that there are common phylotypes in every individual which form a core microbiome which is present irrespective of health or disease. The other phylotypes could be markers of oral health or caries and this fact merits further investigation. These results demonstrate that each group profile can be predicted with reasonable accuracy based on DGGE banding patterns. Even though the molecular fingerprinting profile does not provide immediate discrimination among bacterial species, it enables the analysis of multiple samples and facilitates direct comparison of microbial communities from different samples of interest. Moreover, DGGE-generated molecular fingerprinting also allows the study of changes in individual microbial communities over time and after treatment. One advantage of DGGE profiling is that bands of interest can be excised from the gels and sequenced to obtain more precise information on their taxonomic identity. By doing so, we can obtain valuable information on the types of microbes present and the number of bacterial phylotypes present in each sample. In addition, there is a possibility that even without sequencing, looking at the band pattern in comparison to those of known bacterial strains, presence or absence of a specific bacterial species can be deduced. We observed a significant variation in the DGGE profiles of different groups. The microbial diversity and complexity was less in CA group than in CF and WSP groups. The results of our study also demonstrated that DGGE using 16s rRNA gene as a target can be used to study distinctive bacterial profiles in healthy and caries-affected sites. Moreover, DGGE can be further developed as a pattern recognition tool with which to identify specific groups of bacteria predominantly colonizing sites of varied caries status. We plan to study more number of plaque and saliva samples from CF children and patients with different stages of caries to have a better understanding of the diversity pattern. We are also in the process of evaluating the possibility of using DGGE as a diagnostic tool in dental caries. The authors would like to acknowledge the Central Research Laboratory of Maratha Mandal's NGH Institute of Dental Sciences and Research Centre, Belgaum. Furthermore, we would like to acknowledge Rajiv Gandhi University of Health Sciences, Bengaluru, for providing the financial support to carry out this study. We extend our sincere gratitude toward our President Smt. Rajshree Nagaraju and Principal Dr. Ramakant Nayak for their support. Dewhirst FE, Chen T, Izard J, Paster BJ, Tanner AC, Yu WH, et al. The human oral microbiome. J Bacteriol 2010;192:5002-17. Ling Z, Kong J, Jia P, Wei C, Wang Y, Pan Z, et al. Analysis of oral microbiota in children with dental caries by PCR-DGGE and barcoded pyrosequencing. Microb Ecol 2010;60:677-90. Aas JA, Griffen AL, Dardis SR, Lee AM, Olsen I, Dewhirst FE, et al. Bacteria of dental caries in primary and permanent teeth in children and young adults. J Clin Microbiol 2008;46:1407-17. Takahashi N, Nyvad B. The role of Bacteria in the caries process: Ecological perspectives. J Dent Res 2011;90:294-303. Gross EL, Leys EJ, Gasparovich SR, Firestone ND, Schwartzbaum JA, Janies DA, et al. Bacterial 16S sequence analysis of severe caries in young permanent teeth. J Clin Microbiol 2010;48:4121-8. Nyvad B, Crielaard W, Mira A, Takahashi N, Beighton D. Dental caries from a molecular microbiological perspective. Caries Res 2013;47:89-102. Kugaji MS, Bhat KG, Joshi VM, Pujar M, Mavani PT. Simplified method of detection of Dialister invisus and Olsenella uli in oral cavity samples by polymerase chain reaction. J Adv Oral Res 2017;8:47-52. Muyzer G, de Waal EC, Uitterlinden AG. Profiling of complex microbial populations by denaturing gradient gel electrophoresis analysis of polymerase chain reaction-amplified genes coding for 16S rRNA. Appl Environ Microbiol 1993;59:695-700. Zijnge V, Harmsen HJ, Kleinfelder JW, van der Rest ME, Degener JE, Welling GW, et al. Denaturing gradient gel electrophoresis analysis to study bacterial community structure in pockets of periodontitis patients. Oral Microbiol Immunol 2003;18:59-65. Li Y, Ku CY, Xu J, Saxena D, Caufield PW. 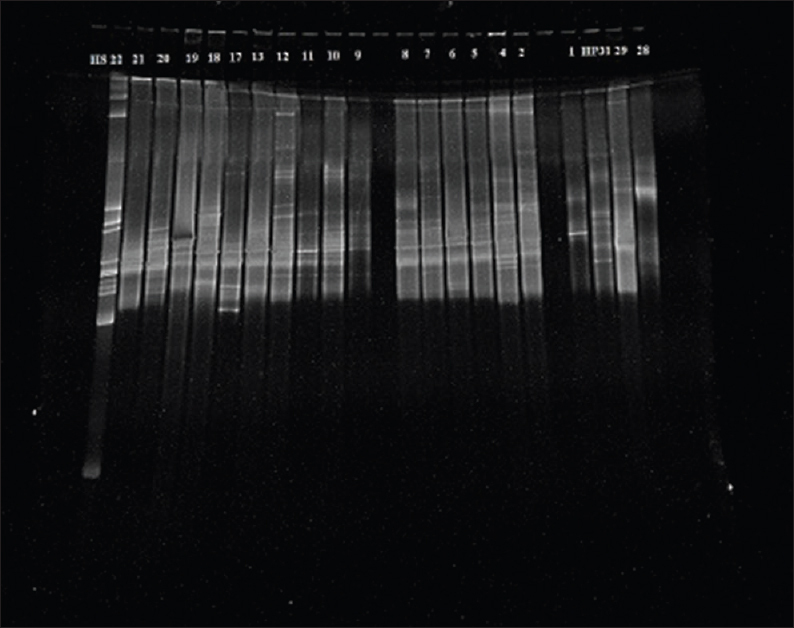 Survey of oral microbial diversity using PCR-based denaturing gradient gel electrophoresis. J Dent Res 2005;84:559-64. Ledder RG, Gilbert P, Huws SA, Aarons L, Ashley MP, Hull PS, et al. Molecular analysis of the subgingival microbiota in health and disease. Appl Environ Microbiol 2007;73:516-23. Ahmed A, Liu J, Moosa Y, Tang L, Zhang S, Xin Y. Microbial profiling of dental caries and periodontitis patients using denaturing gradient gel electrophoresis. Afr J Microbiol Res 2012;6:2559-66. Tao Y, Zhou Y, Ouyang Y, Lin H. Dynamics of oral microbial community profiling during severe early childhood caries development monitored by PCR-DGGE. Arch Oral Biol 2013;58:1129-38. Li Y, Ge Y, Saxena D, Caufield PW. Genetic profiling of the oral microbiota associated with severe early-childhood caries. J Clin Microbiol 2007;45:81-7. Gross EL, Beall CJ, Kutsch SR, Firestone ND, Leys EJ, Griffen AL, et al. Beyond Streptococcus mutans: Dental caries onset linked to multiple species by 16S rRNA community analysis. PLoS One 2012;7:e47722. Reyes CP, Dalmacio LM. Bacterial diversity in saliva and plaque in caries free and caries active Filipino adults. Philipp J Sci 2012;141:217-27. Li Y, Ismail AI, Ge Y, Tellez M, Sohn W. Similarity of bacterial populations in saliva from African-American mother-child dyads. J Clin Microbiol 2007;45:3082-5. Kilian M, Chapple IL, Hannig M, Marsh PD, Meuric V, Pedersen AM, et al. The oral microbiome – An update for oral healthcare professionals. Br Dent J 2016;221:657-66.